Seattle Area Feline Rescue invites you to attend a “Meowsquerade Ball"! Join other local animal lovers at 5:30pm on Saturday, September 29 for the rescue's annual Gala, held at Shoreline Community College. 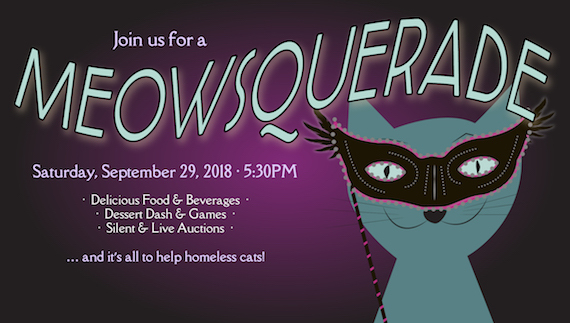 It will be a night to remember, including dinner, dessert, drinks, silent and live auctions, with entertainment from celebrity host Pat Cashman… and it’s all to help homeless cats! Admission costs $70 and includes dinner and hosted beer/wine bar. All proceeds go to save homeless cats and kittens and find them loving families. Get your tickets today for a memorable, life-saving night!